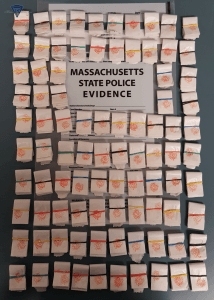 A Springfield VT woman was arrested for Trafficking Heroin in Whatley MA shortly after 4:30 pm on Wednesday. Massachusetts State Police say they stopped Corrina M. Carr 41 for a traffic violation on I-91 in Whately. After an investigation Carr was found to be in possession of 901 bags of alleged heroin. Carr was issued a civil citation for a motor vehicle offense and charge with Trafficking in Heroin and Failure to Wear a Seatbelt. Carr was held on $5,000 bail pending arraignment.